Germany is willing to give Greece financial backing to deal with the unprecedented refugee crisis on its own soil instead of exporting it north towards central Europe. With thousands of refugees pouring into Greece every day and the economy still sputtering, officials in Berlin indicated that Germany would come up with support for Athens in return for a more robust effort to control its borders in the Aegean Sea. 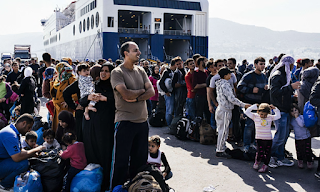 Stressing that there was no connection between any support linked to refugees and the bailout deal agreed this year, as had been suggested in German media, the government admitted Greece’s economy was too delicate for it to be able to deal with the crisis on its own. “We want to support Greece in this, so that it is able to meet its duties as a member of the EU to protect its borders in the most effective way,” the government spokesman Steffen Seibert told journalists in Berlin. A day after the EU unveiled a deal worth up to €3bn (£2.2bn) to help Turkey deal with the Syrian refugee crisis, speculation has mounted that Greece will also need aid. More than 400,000 people have poured into the country this year. Germany has also faced an influx of hundreds of thousands of refugees. By some estimates the total could exceed 1.5 million this year. The prospect of economic aid could galvanise Athens into retaining greater numbers of refugees instead of bussing them north towards the Balkans. The Greek prime minister, Alexis Tsipras, told reporters in Brussels on Friday that Greece, like other frontline states, had raised the issue of the spiralling costs of dealing with the refugees and had pushed for additional financial assistance. Fiscal targets had to be “lightened” and economic support increased, he said, so that his government could handle the migrants with the dignity they deserved. Seibert said some concrete assistance had already been provided in the form of educational aid and equipment. “We will surely come up with more things we can do,” he said. On Thursday, Angela Merkel acknowledged that Greece’s economy was not up to dealing with the thousands of people arriving every day. The German chancellor heads to Istanbul on Sunday to talk with Turkish leaders about the porous border between the two countries. The mood music between Greece and Germany has improved significantly since Tsipras secured re-election last month and moved to push new austerity measures through parliament to unlock a chunk of an €86bn deal agreed in the summer. On Friday night, Greek MPs were preparing to vote for the first time since the election on the austerity package. But the measures – 48 milestones that include jailing tax evaders, expanding a much-loathed property tax and scaling back on early retirement – have raised howls of protest as Greece approaches what is likely to be its most explosive winter yet.